“The compost turner is a technology developed by the project to provide farmers with alternative uses for rice straw that are left on the field after harvest, rather than burn it It can also make land preparation easier for the next cropping season”, says IRRI postharvest scientist and project leader, Dr. Nguyen Van Hung. 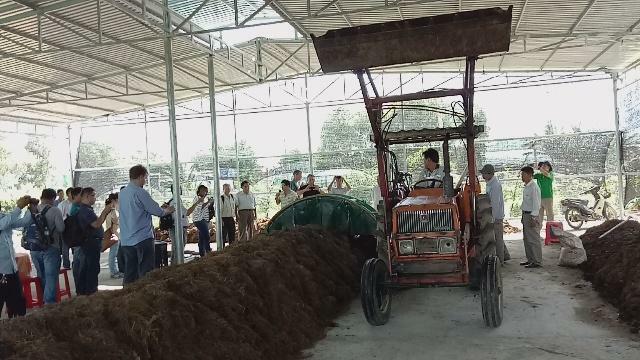 “The composting process makes use of rice straw waste from mushroom production and low quality rice straw from the field, hence, it does not compete with the rice straw being used for the production of ruminant feed,” Dr. Hung adds. In addition, there is also an increasing demand for compost from rice straw. This is being sold at US$1.5-3.0 per 100 kg or USD150-300 per ton of industrial compost. Farmers would normally make soil compost manually through different farming implements or by mixing farm and animal wastes using a bulldozer. “This process is energy intensive and costly as the rental fee for bulldozer is about US$100 for an 8-hour operation,” says Dr. Hung. By having a good mixture of rice straw and animal manure, compost material is made available in forty five (45) days. A few farmers in Vietnam have tried mixing the compost in a pomelo farm and found the results promising. The original design and prototype of the compost turner machine was developed by the scientists from Hohenheim University in Germany. This was later adapted to fit the smaller fields in Vietnam in collaboration with Nong Lam University, Tien Giang University and IRRI. The locally adapted compost turner has a capacity of 30 tons per hour and is operated by connecting it to a 32HP 4WD tractor. The field demonstration was attended by researchers and experts from IRRI, CGIAR Challenge Program on Water and Food (CPWF), Philippine Rice Research Institute (PhilRice), Philippine Carabao Center (PCC), University of the Philippines-Los Baños (UPLB), Nong Lam University (NLU), Loc Troi, Cuu Long Delta Rice Research Institute (CLRRI), Vietnam National University of Agriculture, Vietnam Academy of Agricultural Sciences (VAAS), and Tien Giang University. It took place at Hung Thanh Commune, Tan Phuoc District, Tien Giang Province and was followed by a writeshop to outline the book on Rice Straw Management which was facilitated by Dr. Boru Douthwaite, former Impact Director of CPWF. The compost turner machine will also be piloted and disseminated in other countries involved in the implementation of the rice straw management project, particularly the Rice Straw PH project in the Philippines funded by DA-BAR.